¡Toca las mejores canciones de rock de la historia y conviértete en una auténtica leyenda! 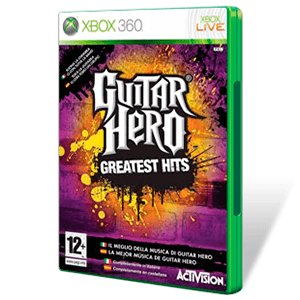 Guitar Hero Greatest Hits incluye una recopilación de las 48 mejores canciones de la saga que podrán ser tocadas con los cuatro instrumentos: guitarra, bajo, batería y voz. Esta nueva entrega incluye lo mejor de Guitar Hero I, II, Rocks the 80s y III. en modos online y offline incluyendo el modo Carrera, una batalla online de bandas para 8 jugadores y las nuevas funcionalidades aparecidas por primera vez en Guitar Hero World Tour: Music Studio, GHTunes y el Creador de Estrellas de Rock. Blue Öyster Cult - "Godzilla"
Boston - "More Than A Feeling"
Deep Purple - "Smoke On The Water"
Franz Ferdinand - "Take Me Out"
Joan Jett & The Blackhearts - "I Love Rock N’ Roll"
Pantera - "Cowboys From Hell (Live)"
The Donnas - "Take It Off"
The Exies - "Hey You"
White Zombie - "Thunder Kiss '65"
Alice In Chains - "Them Bones"
Avenged Sevenfold - "Beast And The Harlot"
Iron Maiden - "The Trooper"
Kansas - "Carry On Wayward Son"
Lamb Of God - "Laid To Rest"
Lynyrd Skynyrd - "Free Bird"
Mötley Crüe- "Shout At The Devil"
Reverend Horton Heat - "Psychobilly Freakout"
Stone Temple Pilots - "Trippin' On A Hole In A Paper Heart"
The Police - "Message In A Bottle"
Anthrax - "Caught In A Mosh"
Extreme - "Play With Me"
Judas Priest - "Electric Eye"
Poison - "Nothin' But A Good Time"
Ratt - "Round and Round"
DragonForce - "Through The Fire And Flames"
Aerosmith - "Back In The Saddle"
Los clásicos de la saga Guitar Hero se reúnen en este recopilatorio muy poco ambicioso.